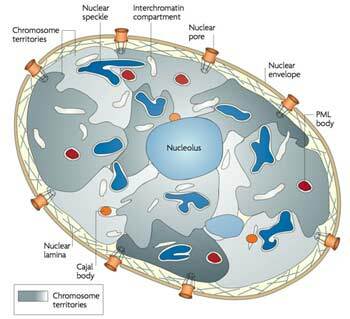 Every human cell has 46 chromosomes: 23 from mom and 23 from dad. Each chromosome is DNA library with two protective caps known as telomeres. All multicellular organisms have telomeres, even plants. In humans and other animals with backbones, they are made of six basepairs, TTAGGG on the 3′ end that overhangs and is folded back and protected by protein complexes known as ‘shelterin’ (see below.) Like aglets on shoelaces, telomeres protect the tips of the chromosome from ‘fraying.’ Without them, DNA repair enzymes might recognize the tips as breaks that need to be pruned, spliced, or joined. 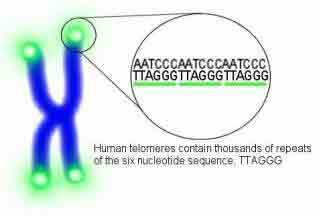 At birth, the average human telomere length is 10,000 base pairs. At 20 years, the average telomere length is 8,000. By age 50, around 7,000 remain. And so it goes, losing 50-100 base pairs a year until only 4000 remain at age 100. Note from the slope of the graph that the loss is faster in childhood (when the body is growing) and in old age (when telomerase activation is limited.) interestingly, the greatest rate of loss is from conception until birth, when an entire human is being constructed by intense cellular reproduction and differentiation. The original telomere length of 15,000 is probably established by the egg at conception but drops an amazing 5,000 base pairs to 10,000 at the time of birth. As a Patton Protocol client, you can test your telomere length as one of many biomarkers of aging that we measure for you. It was once believed that cell lines were immortal. But to reproduce, each successive generation of cells needs to unzip and copy all 46 chromosomes, giving each daughter a perfect copy. 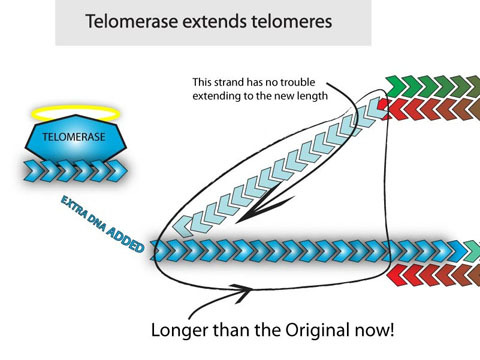 telomeres can’t be longer than its mother’s and will actually be shortened each division. This is known as …. 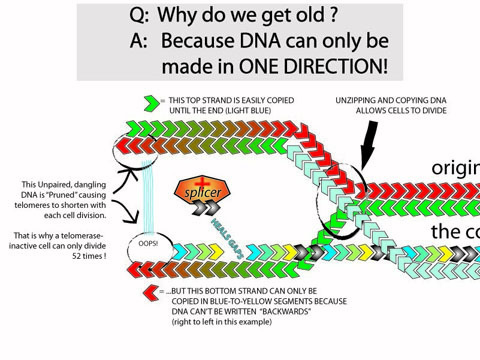 In the cartoon above, the red and green master copy of the chromosome’s double helix is being unzipped and copied into a light blue daughter copy (the 5′ to 3′ strand) and the blue-to-yellow 3′ to 5′ strand. Those newly synthesized strands will combine to form a shorter, daughter copy.The light blue 5′ to 3′ copy is made easily because that is the correct and only direction DNA is zipped together. But the blue to yellow 3′ to 5′ copy made from the original green master (5′ to 3′) has to be made in 5′ to 3′ segments with the gaps backfilled in by an enzyme. At the “OOPS!” area above, the 3′ to 5′ strand is shortened an average of 50-100 basepairs because the end fragment couldn’t start copying at very end of the parent’s 5′ strand. The daughters’ shorter strands will lead to an even shorter copies in the granddaughters. And so on, and so on until the Hayflick Limit comes into play. Clearly, cells freshly-minted from master stem cells with actively-lengthening telomeres are better off than cells born of doomed, telomerase-inactive regular cell lines. Luckily, the telomeres are like blank tape leaders that don’t contain any ‘music.’ Telomeres are expendable – up to a point. But if any of the 92 telomeres in each cell becomes critically short, bad things start to happen. If we’re lucky, the “guardian of the genome,” an enzyme named p53, will force rogue cells into apoptosis. If not, a dysfunctional or senescent cell line can become established or worse yet, the line can become malignant. If a non-stem cell escapes p53 and becomes malignant, it has a good chance to burn out due to the Hayflick limit (assuming it doesn’t find a way to activate telomerase.) But if a stem-cell line becomes malignant, the “Cancer Stem Cells” may lead to what we would clinically recognize as cancer. This is another compelling reason to keep the stem cells’ telomeres long and healthy. Stem cells need to reproduce too frequently to survive the Hayflick limit. So they turn on telomerase. Telomerase-active stem cells include some skin cells, intestinal cells, and blood-producing cells. Because the daughters copy from their mother’s DNA, the daughters can’t start life with telomeres longer than their mother’s and they will inherit any accumulated DNA transciption errors that occurred in their ancestors. It is those DNA errors that make us look old. The diagram below shows the purple telomere being extending from its chromosome in the upper left background. The “Active Site” is where the colorful blobs that make up this telomerase enzyme complex (aka ‘shelterin’) will add the new six base pair repeats TTAGGG over and over again. The green strand is the telomere RNA, which is like the “key” for the ignition of the telomerase engine. Cajal bodies are sites of the aforementioned RNA splicing and are found in rapidly reproducing cells such as stem cells, cancer, and neurons. Those Cajal bodies are sites of telomerase activation and are busy lengthening the shortest of the 92 telomeres.